Internationally Renowned, Gifted Psychic Medium/Healer/Teacher. I can tell you what He/She is thinking/feeling. 5 star Advisor. I tune in quickly and channel Spirit = Accurate answers for you. NO 2 min readings! Gifted since childhood, I have always had that sense of 'knowing'. I can tune into energy quickly and provide detailed and accurate information for the seeker. My readings are spiritual in nature. I have been a professional Psychic/Medium for more than 25 years. My guidance is spiritual in nature and highly accurate. 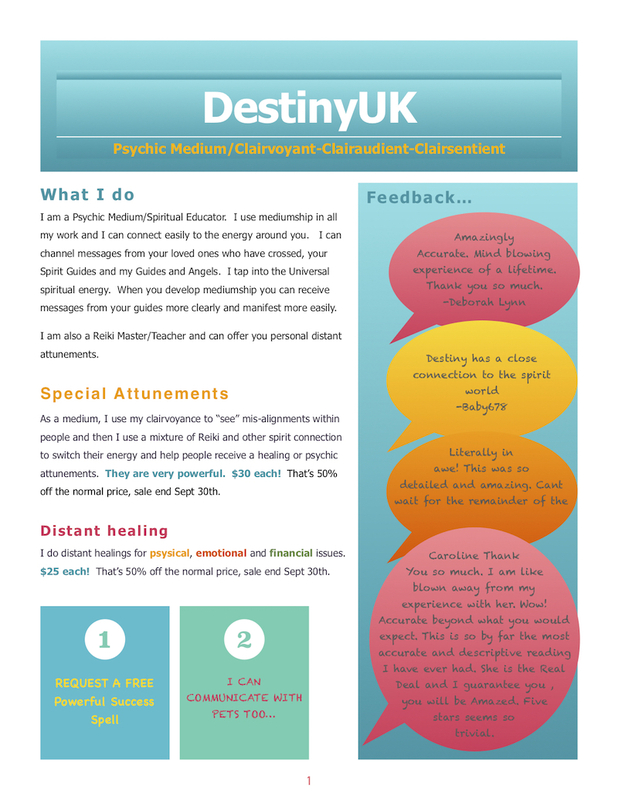 I can give you insight into your circumstances to assist you with your choices going forward. Tuning into the energy around you gives me the whole picture and can enlighten you as to the motives. sorry but you were wrong. no communication last week. I also feel you didn't connect with the situation mentioning how he didn't want to name the situation bf/gf....thats actually never been the issue. commitment was never the issue and you couldn't pick that up. there was a specific reason we weren't together and you didn't pick it up. your rate is way too high to be completely off. DestinyUK has been a user of Keen since 2004. Getting Life Questions advice from DestinyUK through www.keen.com is safe, secure and confidential.